Place greens, lettuce, chili, cucumber, mint, parsley, cilantro, and broth in blender jar. Blend on high speed, scraping down sides of blender, until all ingredients are well combined. Add avocado and cream and continue to blend until creamy. Add desired amount of salt and pepper, also more broth and/or cream to adjust consistency; blend well. Serve in cocktail glass with soup spoon, finish with chopped chives and drizzle of oil. Garnish with shrimp or rolled slices of ham, as desired. Last summer, when poking around to find the perfect recipes when I took the reins as Tapas Chef at BarComida, one of my most refreshing and popular experiments turned out to be Green Gazpacho. This summer, my guests report a similar experience as they did last summer. While it always renders rave reviews, they notice that it tastes slightly different each time they enjoy it. Not surprisingly, it is a very forgiving recipe, and lends itself beautifully to adding your own signature and switching it up each time. When using simple base ingredients to begin, it will always be OK to add (and if you insist, subtract) seasonal green vegetables and related condiments that you love and/or have handy. You can trust that it will always refresh and please palates, regardless of how you choose to prepare it. 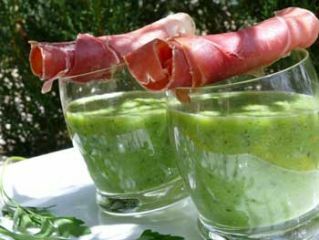 This Green Gazpacho also has special qualities that provide cooling relief during the summer, per the mention in our July Appetizing News issue, about the good work of Dr. Group of the Global Healing Center. Cucumber, leafy greens, and a handful of fresh organic herbs are a powerful combination for cooling body temperatures, and all of the above are key ingredients in this chilled soup. As a “small plate”, it makes an exquisite first course. A classy presentation is on ice: place a highball cocktail glass in a shallow dish, and surround with crushed or small cubed ice. Fill the glass half to three-quarters full of the soup, and finish it with some finely chopped herbs or chives, and a drizzle of fine extra-virgin olive oil. I love serving it with two large cooked shrimp as a garnish on the side of the cocktail glass, or glass topped with rolled slices of ham - jamon serrano or even prosciutto - as shown in the photograph. Offering guests a protein that is interesting and pretty, as a dipper for the soup, makes the whole experience heartier and more Mediterranean. So without further ado, here is the recipe for impressing and cooling off your guests this summer. Use this recipe as a base, and don’t forget to add or subtract whatever you think would taste good, because there’s an excellent chance that it will! A la salud ~ as the Spanish may say ~ to your health!